The KiwiSDR is a 14-bit wideband RX only HF software defined radio created by John Seamons (ZL/KF6VO) which has up to 32 MHz of bandwidth, so it can receive the entire 10 kHz – 30 MHz VLF/LF/MW/HF spectrum all at once. 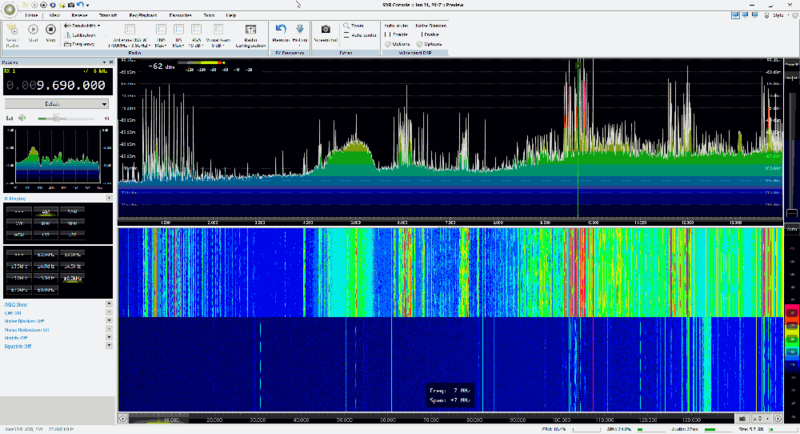 However, it is not a typical SDR as you do not connect the KiwiSDR directly to your PC. Instead the KiwiSDR is a cape (add on board) for the Beaglebone single board computing platform. If you’re unfamiliar with the Beaglebone, it is a small computing board that is similar to a Raspberry Pi. 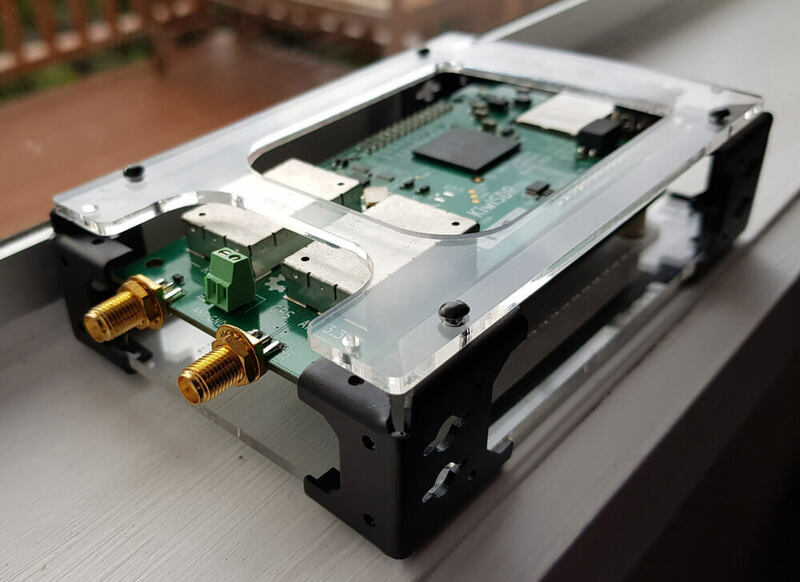 The KiwiSDR is designed to be a low cost standalone unit that runs 24/7, connects to your HF antenna and internet network, and shares your 10 kHz – 30 MHz reception over the internet with up to 4 simultaneous users. The KiwiSDR kit retails for $299 USD (Amazon) (Direct from Seeed Studio), and with that price you get the KiwiSDR cape, a Beaglebone Green board, an enclosure, microSD card and a GPS antenna. If you already have a Beaglebone lying around, then you can purchase the KiwiSDR board only for $199 USD. Because the KiwiSDR is a network SDR, instead of connecting it to your PC it connects to your home internet network, allowing you to access it from any computing device via a web browser. Direct access to the SDR is not possible (actually it seems that it is, but it’s not easy to do), and all the computing is performed on the KiwiSDR’s on board FPGA and Beaglebone’s CPU before being sent to the network. Thus raw ADC or IQ data is never touched by your PC, your PC only sees the compressed audio and waterfall stream. So a powerful computer is not required to run the SDR. In fact, a mobile phone or tablet will do just fine. In comparison, a $299 USD wideband non-networked SDR such as the LimeSDR uses a 12-bit ADC and can do up to 80 MHz of bandwidth over USB 3.0. But even on our relatively powerful PC (i7-6700 CPU, Geforce GTX 970 and 32 GB RAM) the LimeSDR can only get up to about 65 MHz on SDR-Console V3 before performance becomes too choppy. But the real reason to purchase a KiwiSDR is that it is designed to be shared and accessed over the internet from anywhere in the world. You can connect to over 137 shared KiwiSDRs right now over at sdr.hu which is a site that indexes public KiwiSDRs. To achieve internet sharing, the KiwiSDR runs a modified version of András Retzler’s OpenWebRX software. OpenWebRX is similar to WebSDR, but is open source and freely available to download online. The standard OpenWebRX is also designed to support the RTL-SDR. Of course if you don’t want to share your receiver over the internet you don’t have to, and you could use it on your own local network only. Some applications of the KiwiSDR might include things like: setting up a remote receiver in a good noise free location, helping hams give themselves propagation reports by accessing a remote KiwiSDR while they are TXing, listening to shortwave stations, monitoring WSPR or WEFAX channels, education, crowd sourced science experiments and more. RTL-SDR enthusiast and blogger Akos has recently uploaded three new articles. 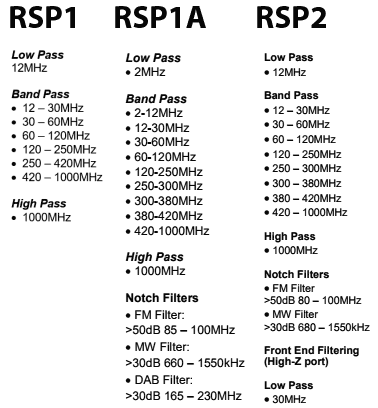 In his first article he discusses what he believes is the differences and advantages of Generic vs Premium branded RTL-SDR dongles. In his second article he shows how easy it can be to perform the direct sampling mod on newer dongles, as most have the direct sampling break out pads. He shows how it can be as easy as sticking a wire into these holes. 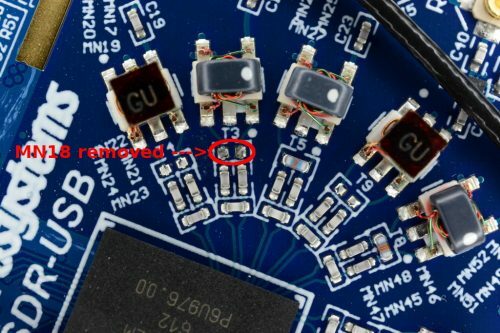 Please note that if doing this we would caution you to take decent ESD precautions as these pins are not ESD protected. In the third article he reviews the recently release Nooelec SMArt dongle. The SMArt is a new RTL-SDR variant which comes in a smaller black case, cooling via thermal pads and with an SMA connector. With these modifications it is very similar to our RTL-SDR.com units, however the one advantage of the SMArt is that it is small enough to fit two side by side on closely spaced USB ports, like on the Raspberry Pi. In the post he shows what is inside the SMArt and discusses various points such as heat generated, included antennas and performance. Inside the new Nooelec SMArt RTL-SDR dongle. 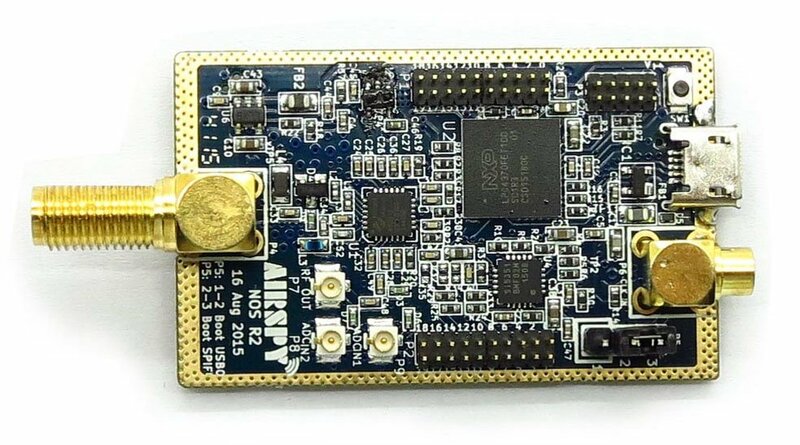 The Airspy Mini is a recently released $99 USD software defined radio with a tuning range of 24 MHz to 1800 MHz, 12-bit ADC and up to 6 MHz of bandwidth. The Mini is the younger brother of the $199 USD Airspy R2, but despite the $100 USD price difference, both units are very similar, which makes the Mini a very attractive option. The idea is that the Mini is the cheaper version for those who do not need the more advanced features of the R2. In a previous review we compared the Airspy R2 with the SDRplay RSP and the HackRF. In those tests we found that the Airspy had the best overall RX performance out of the three as it experienced the least amount of overload and had the most dynamic range. 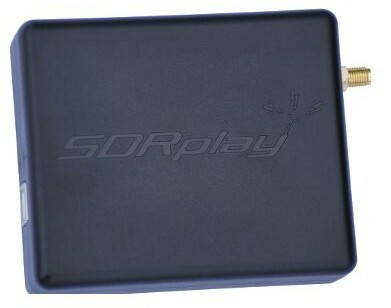 The SDRplay RSP was the main competitor in performance to the Airspy R2, and was found to be more sensitive due to its built in LNA. But the RSP experienced overloading and imaging problems much easier. With an external LNA powered by its bias tee, the Airspy gained a similar sensitivity and still had very good dynamic range. The main downside to the Airspy R2 was its higher cost compared to the $149 USD SDRplay RSP, and needing to fork even more for the $50 USD SpyVerter if you want to listen to HF signals. In this review we'll compare the difference between the R2 and Mini, and also see if the cheaper Airspy Mini ($99 USD), or Airspy Mini + SpyVerter combo ($149 USD) can compete in this lower price range. Right now the "early bird" price of the Mini is $99 USD. We are unsure if this price will go up in the future. The external design between the two units is different. The Mini comes in a USB dongle form factor which is very similar to a standard RTL-SDR, whilst the R2 comes in a larger box with a female Micro USB input. In our tests this metal enclosure appears to provide good shielding from strong signals. One thing that was missing on the unit was a nut and washer on the SMA connector. 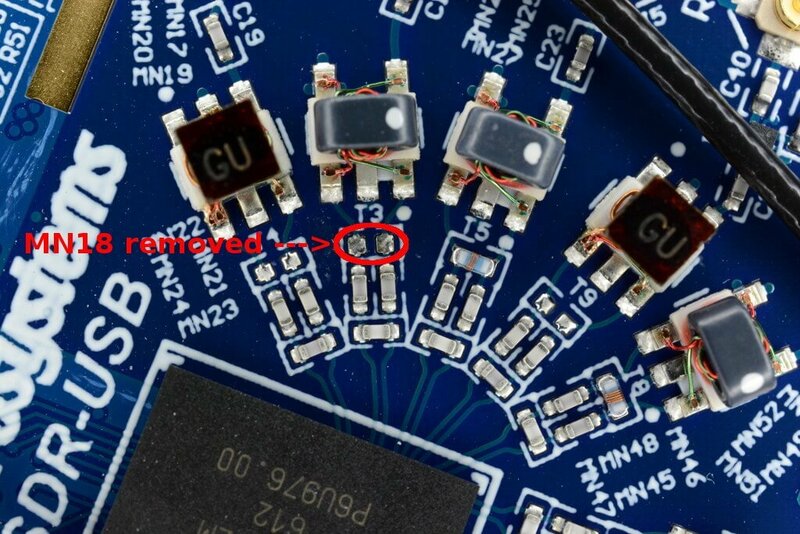 Adding a nut helps the PCB ground make good contact with the aluminum enclosure. The Airspy team have said that future units will come with this nut provided. 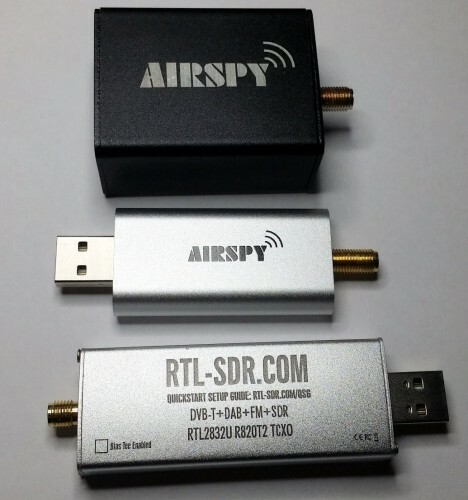 Airspy R2 (top), Airspy Mini (Middle), RTL-SDR (bottom) for size comparison. Apart from the price and enclosure, the most noticeable feature difference between the two is the smaller bandwidth of the Airspy Mini. 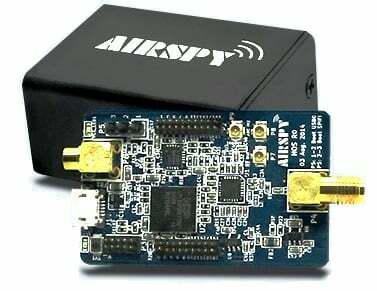 Unlike the Airspy R2, the Airspy Mini does not use a Si5351 clock generator chip. The lack of this chip limits the Mini's maximum bandwidth to 6 MHz and eliminates any ability to use an external clock. The main applications that you miss out on from the lack of an external clock input include: coherent clock, passive radar and direction finding experiments. From the circuit photos below we can see that the Mini consists of mostly the same parts used in the Airspy R2. Missing is the Si5351 clock controller, expansion headers and the external clock input. Recently FlightAware released a new RTL-SDR dongle sold at zero profit at $16.95 USD. It’s main feature is that it comes with an ADS-B optimized low noise amplifier (LNA) built directly into the dongle. FlightAware.com is a flight tracking service that aims to track aircraft via many volunteer ADS-B contributors around the world who use low cost receivers such as the RTL-SDR. In this post we will review their new dongle and hopefully at the same time provide some basic insights to LNA positioning theory to show in what situations this dongle will work well. A good LNA has a low noise figure and a high IIP3 value. Here is what these things mean.